I’ve never been to Mexico. There, I’ve said it. I’ve traveled in 24 countries on 5 continents, but Mexico is not one of them. I haven’t been to Canada, either, but that’s a different post. For never having been to the country, I really enjoy the food. My favorite Mexican treat is paletas and for a few years I experimented with different recipes (before the blog) and our freezer was full of paletas in the summertime. So with the Cinco de Mayo celebration last weekend, I couldn’t pass up the opportunity to do paletas, but I’m not sure where my equipment is—it’s been MIA since the move—so I made a simple ice dessert this time. The combination of mango and lime really works well, a nice balance of tart and sweet; very refreshing after a spicy meal or a hot afternoon outdoors. My boys love mango and they were constantly on me while making this. My two-year-old has such a cute way of opening his eyes wide and asking, “Mommy, taste? Please?” And of course once he got a taste, he wanted more! 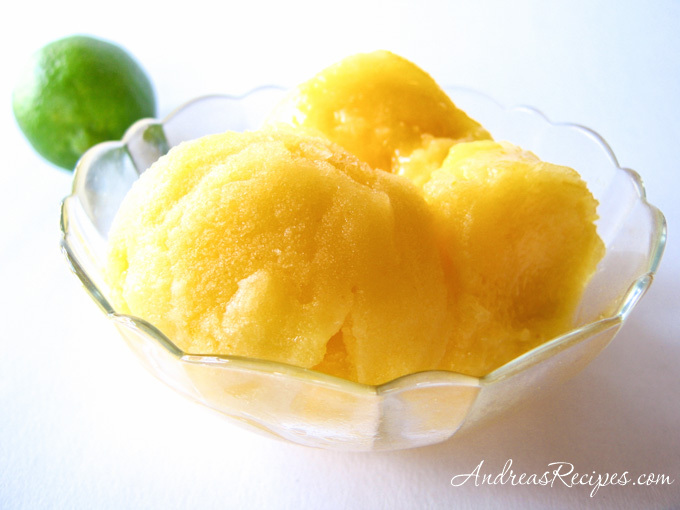 The recipe calls for fresh mango, but I use frozen cut mango and it is very easy; just measure and mix. However, don’t be tempted to use bottled lime juice because it won’t taste as good. Stick with the fresh lime. The ice is pretty slushy, not firm, and it takes about 7 hours to prepare with 3 cycles of freezing and slushing, so plan ahead but don’t let the time daunt you. The active preparation time is only about 20 minutes total, and the rest of the time it’s just sitting in the freezer turning to ice. You can start it in the morning and have it ready to go in time for a party, or you can make it the night before then let it sit in the refrigerator for up to 30 minutes before serving. You’ll have quite a bit of pulp left over after pressing the mixture through the strainer. So what to do with all that pulp? You can throw it in the blender with some yogurt and make a smoothie, or pour it over ice cream, or go for the simple solution and just grab a spoon and eat it straight out of a bowl, which is what I did! If you don’t have an immersion blender to use during the freezing/scraping cycles, you can use a fork and just scrape away at the icy surface and then stir well before putting back in the freezer. This is also my contribution to A Taste of Yellow for Livestrong Day sponsored by Winos and Foodies. Update: Check out the round up 143 entries (an amazing number!) for A Taste of Yellow for Livestrong Day. There are some lovely dishes! 1. In the food processor, combine the mangoes, orange zest, sugar, lime juice, and water. Process until smooth, then press through a mesh strainer into a stainless steel bowl or 9×9-inch pan. You don’t want any of the pulp in the bowl, just the liquid. 2. Freeze until the mixture is firm 2 inches in from the sides, about 2 hours. Whip with an immersion blender or scrape with a fork until it’s slushy. Repeat the freezing and whipping process 2 more times, then freeze at least 1 hour before serving. Thank you Andrea they look so refreshing and colorful. Thanks for stopping by, Barbara, and I’m looking forward to the round up! Looks so refreshing, Andrea! Mango and lime together must taste fantastic. Hi Patricia! The combination really is so good, especially frozen!